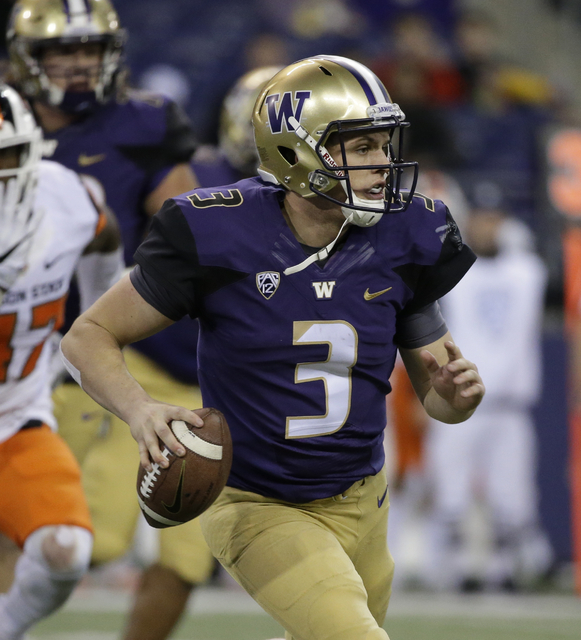 Led by sophomore quarterback Jake Browning, fourth-ranked Washington is a double-digit favorite at Utah on Saturday. The line appears inflated. Three years into his rebuild of a once-vaunted program, coach Chris Petersen has Washington squarely in the College Football Playoff conversation. 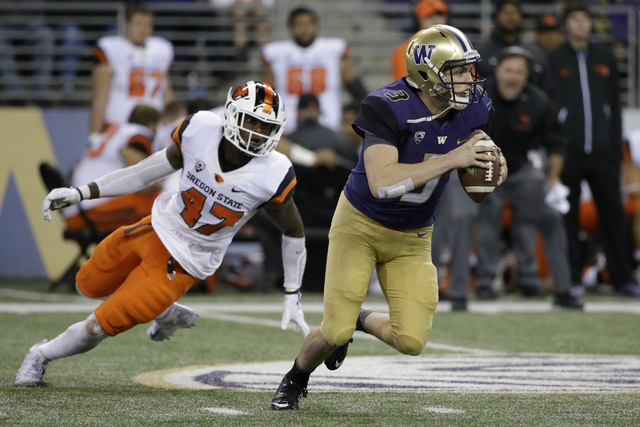 Led by sophomore quarterback Jake Browning, the fourth-ranked Huskies are 7-0 entering Saturday’s trip to Salt Lake City, where they will battle 17th-ranked Utah (7-1) in a pivotal Pac-12 Conference game. While the Pac-12 is considered down as a whole, the Huskies clearly have been the class of the league, outscoring opponents by 33 points per game. Washington has been tested only once, and that was in a 35-28 overtime victory at Arizona five weeks ago. Utes senior Joe Williams, who rushed for 477 yards last season as Devontae Booker’s understudy, retired from college football two games into this season because of an assortment of injuries. More bumps and bruises in the Utah’s’ backfield led coaches to ask Williams to return to the team. He accepted the invitation and has been dynamite since his reappearance, rushing for more than 500 yards in the past two games, including 332 yards in a 52-45 win at UCLA. Washington ranks high in many NCAA statistical categories, but rushing defense is not one of them. The Huskies allow 164 yards rushing per game and 4.2 yards per carry to sit at No. 61 in both categories. Historically, Utah has been a moneymaker as a home underdog against ranked opposition, going 8-4 ATS in the role since 2000. The Utes’ Kyle Whittingham, like Petersen, is one of the league’s top coaches. Washington is the trendier side in most circles, but the number seems inflated when assessing all pieces of the handicapping puzzle. Take the 10½ points with Utah. • Cincinnati-TEMPLE (Over 53½) — It’s a head-scratcher to many observers as to why Gunner Kiel did not get his first real opportunity at quarterback this season for Cincinnati until last week. And while East Carolina is not the cream of the American Athletic Conference crop, the Bearcats scored 31 points and Kiel passed for 348 yards against the Pirates. • Texas Tech (+9½) over TEXAS CHRISTIAN — Texas Tech’s defense will not draw comparisons to the 1985 Chicago Bears. Or the 2016 Bears, for that matter. But quarterback Patrick Mahomes Jr. and the Red Raiders can sling it around the yard, and TCU is perhaps the biggest disappointment in a league full of flops. • TEXAS (+3½) over Baylor — Despite playing in a Power Five conference — though some might question the Big 12’s inclusion in such a group this season — Baylor’s strength of schedule ranks 114th by Jeff Sagarin, whose work appears in USA Today. The Longhorns are better at home and are playing for Charlie Strong’s coaching life in Austin. • FLORIDA STATE (+4½) over Clemson — With a defense ranking near the bottom of the NCAA in several key categories, the Seminoles’ playoff hopes were laid to rest weeks ago. Clemson and quarterback Deshaun Watson remain in the thick of that conversation, but the Tigers will get Florida State’s “A” game in Tallahassee. • MISSISSIPPI (+4½) over Auburn — Few Power Five teams have improved over the course of the season as much as Auburn. The Rebels are bruised physically and emotionally — especially on defense — and somewhat of an afterthought at this point in the Southeastern Conference West pecking order. It’s late October, though, and home underdogs sometimes bark their loudest late in the season.